Oh cool! 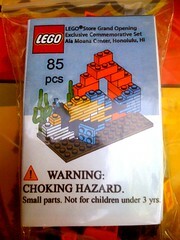 Found this LEGO Store grand opening set from Honolulu, Hawaii on Flickr... There's a few random photos from the store already up... There's a few photos from the WitC that look pretty cool as well. The store looks a little smallish, but there's a PaB and BaM (Build-a-Minifig) areas. Update: Found another set of photos from the opening. In other news, The LEGO Experience truck was in Chicago this past weekend... There's a few pictures of it up on Flickr already. I looks like fun, but none of the cities are close to where I live... as a matter of fact, the tour doesn't seem to be hitting too many cities this time (I could be wrong; but maybe it's gas prices). I went to a tour a few years ago; snapped a few photos, looked inside at the LEGO display inside the semi-truck... I forget, but I think TRU was running a special sale when the tour was in town. Anyway, if anyone other there snap any photos of the LEGO Experience, please let me know.